Includes: Initial Procedure + One Free 5-6 weeks touch up and Free after care package. A 30 minute in person consultation is required before your Initial microblading appointment. During the consultation your technician will discuss with you the overall procedure and explaining everything you'll need to know. For tools. We only use disposable microblading pen single used, pre sterilized with expiry date showing. 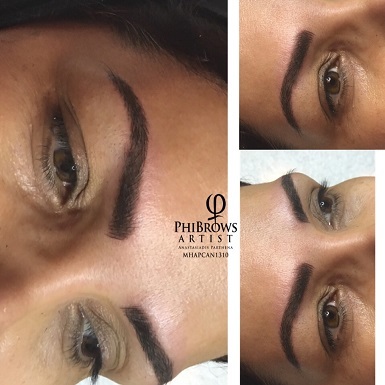 Microblading is a hand method of permanent cosmetics for your eyebrows, which creates extremely fine and natural looking hair strokes. 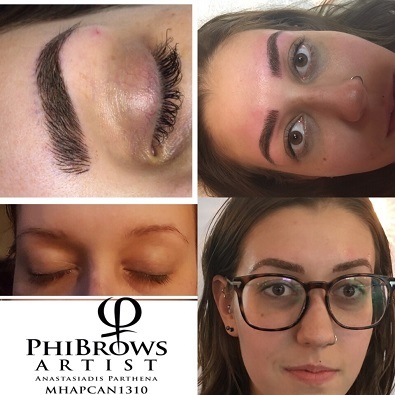 This technique is a unique process tailored to benefit individuals who desire brow definition, to cover gaps of lost hair, to extend an area, or full reconstruction if the brows have little to no hair. 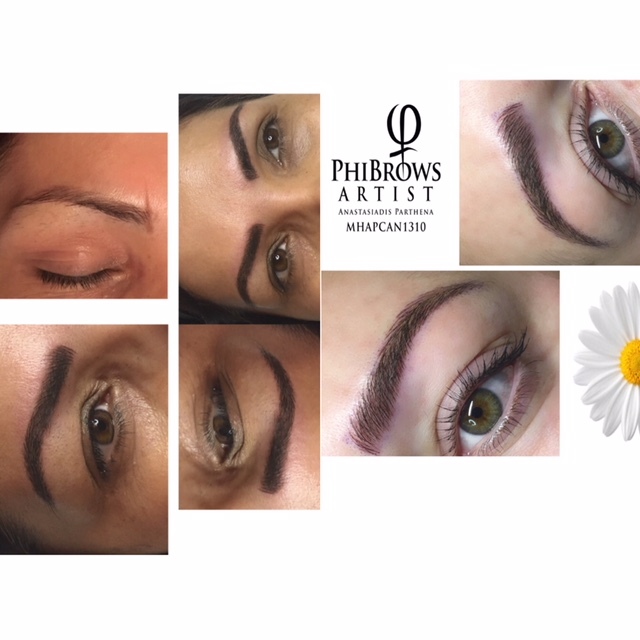 What Are the Differences Between Permanent Makeup (PM) and a Tattoo? PM is a process of implanting pigment into the upper layer of the skin, also known as the epidermis. The epidermis is the outer layer of skin that is visible to all and is constantly shedding and renewing itself. The process of cells turnover makes colors fade. The tattoo process deposits the pigment into the second layer of the skin, the dermis. The cells of the dermis are far more stable than the cells of the epidermis, so the tattoo's ink will stay in place, with minor fading and dispersion throughout someone's entire life. The pigment gets applied with a specific tool that has a row of several fine needles to create thin, hair-like marks on the skin. Your artist will choose the needle and blade type according to the technique and your skin type. The pigment is bladed just below the epidermis and the shallowest part of the dermis, making natural-looking hair strokes. A natural result is achieved as the hairs get bladed into the skin, according to the direction of the natural hair growth. Depending on your skin type and care, the pigment will fade slowly over 18 months. Your eyebrows will go through several phases during the healing cycle. A true reflection of healed color can only be assessed 3 to 4 weeks after treatment. Touch-ups or correction of the shape and design is recommended at least 5 weeks after the initial treatment. Your eyebrows will go from too dark to too light to just right. Immediately after the procedure, the pigment is still seating on top of your skin and has not yet settled in completely. Once the healing of the skin starts taking place, it will look like dandruff flakes or dry skin. The healing process might give you the impression that the color pigment is fading too quickly. However, this is just a superficial color, and dry skin is naturally removed from your eyebrows. Your eyebrows will be the lightest tones during days 5 to 12 because the color gets absorbed into the deeper layers of the skin. Later, skin cells push it back to the upper layers. Once the healing is completed, you will enjoy your beautiful new brows. An anesthetic is applied during the treatment to keep pain at a minimum, so it is completely tolerable. What Happens During the Microblading Touch-Up? During your touch-up, the artist will fill missing hairs, add or make hairs longer, or adjust achieve a darker colour. How long does the microblading service last? The appointment should take about 2 to 3 hours. Pregnancy/breastfeeding. If you have tendency to keloid, birthmarks or moles. After Care Instructions will be given to you upon completion of the service.